The Angular team has announced a minor release to its web development framework for desktop and mobile apps. 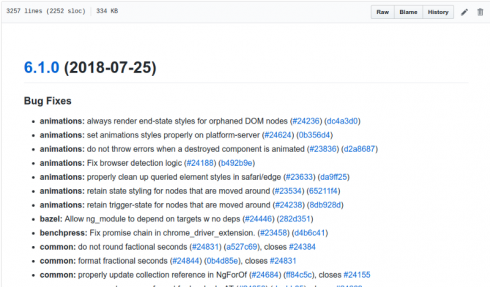 Angular 6.1 is a drop-in replacement for 6.0 and comes with new features and bug fixes. According to the Angular team, this is the last minor 6.x release planned and developers can start to expect 7.0 betas as the team works towards the next major release. New features in this release include router scroll position restoration, ShadowDOM v1 view encapsulation, and schematics chaining. The scroll positioning feature enables developers to “configure the router to remember and restore scroll position as the user navigates around an application. New navigation events will reset the scroll position, and pressing the back button will restore the previous position,” the team wrote in a post. In addition, the team explained this will eventually become the default in future major releases. Schematics chaining was improved with more support for returning a rule from an existing rule in this release. “This allows developers to more dynamically determine the set of rules to follow when designing Schematics,” the team wrote. In addition, Angular 6.1 comes with support for TypeScript 2.8 and 2.9.